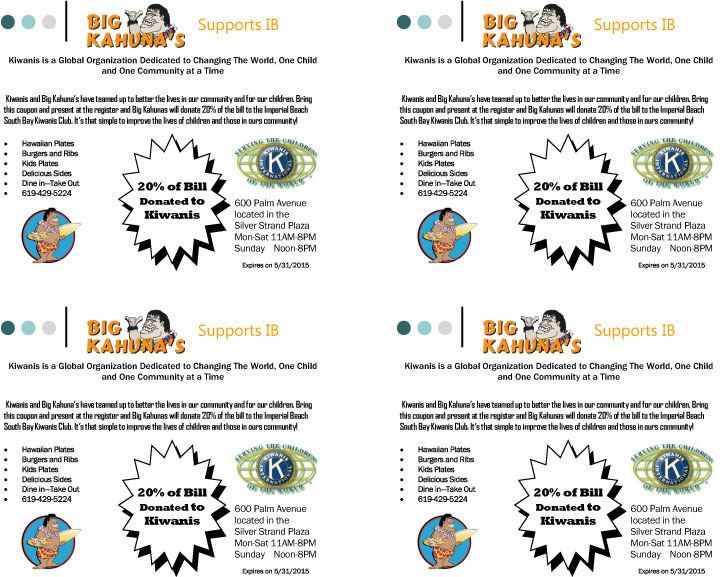 Big Kahuna's Supports IB. 20% of Bill Donated to IB Kiwanis. Now you can eat at Big Kahuna's and enjoy one of their World Famous Burgers or any of the other tasty items on their menu and support the IB Kiwanis. The IB Kiwanis work includes helping local children with programs such as “Student of the Month” and book donations to schools. They help feeding the needy families of IB at Thanksgiving. The IB Kiwanis hold a “Kids Fishing Derby” annually. They support SPORTS for Exceptional Athletes and provide helmet to children for safe bicycling. They raise lots of money for Rady Children’s Hospital. Rady is the largest children’s hospital in California. Their work stretches worldwide with “Project Eliminate”. "Project Eliminate" is a program to help eliminate MNT or Maternal/Neonatal. Thanks to the generosity of Kiwanis members around the world, UNICEF and its partners, 36 countries have now officially declared victory over the pain and suffering of MNT. We are changing the world. With Big Kahuna's help they will raise money to support these and other activities. I'd also mention how we appreciate very much Big Kahuna's support. In fact you may want to mention the manager/owner and talk to him. His name is Paul.